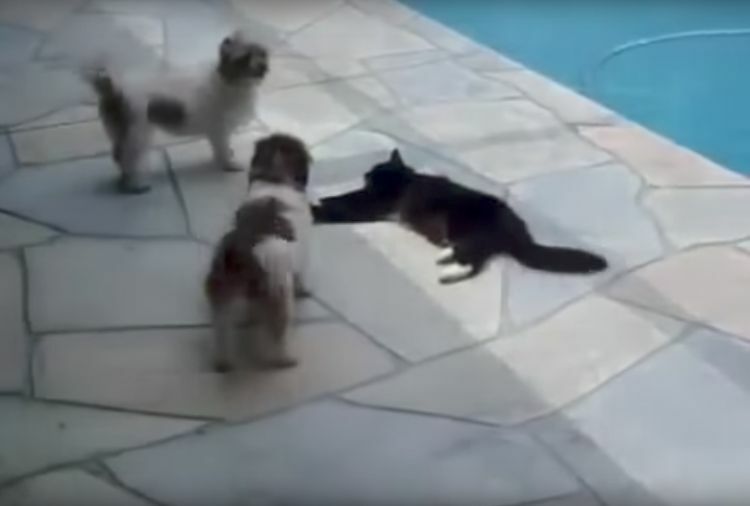 Two Lhasa apso dogs are getting on this cat’s nerves as they carry on a conversation in Cockney British. 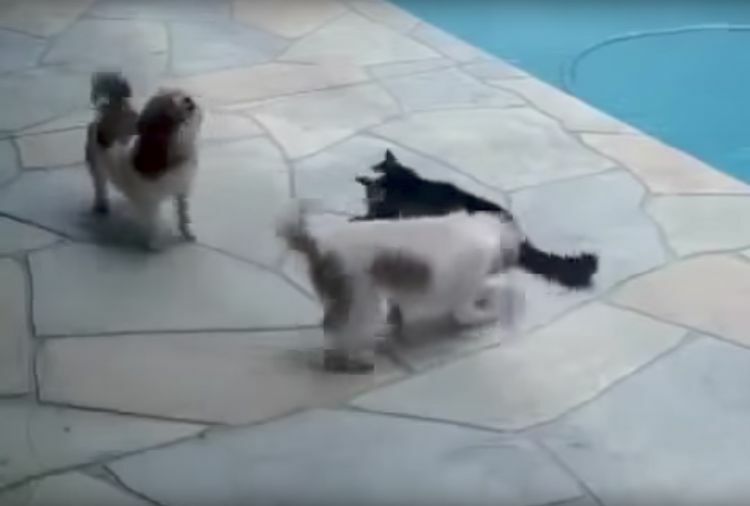 While it’s hilarious watching the dogs make the cat increasingly angry, their remarks make it all the funnier. At first the cat simply lays her ears back and lashes the tip of her tail. After all, cats are masters of zen and can ignore a lot of irritating behavior. But the two yappers simply cannot let a sleeping, er, cat lie. They just have to push the envelope, sometimes one at a time and sometimes annoying her together. The cat’s demeanor is showing a little irritation now. She’s still giving them the benefit of the doubt, offering to leave them be if they’ll give her the same courtesy. But they won’t. They keep poking at her, talking over each other as they do. What started out as a nice afternoon nap for the feline is now becoming a lesson in patience. Her ears begin to twitch back and forth, and more of her tail is in motion now — these two mongrels are really, really annoying! Still the dogs carry on. You can almost hear the cat’s exasperation as she begins plotting. This time, these frustrating fools have gone too far. 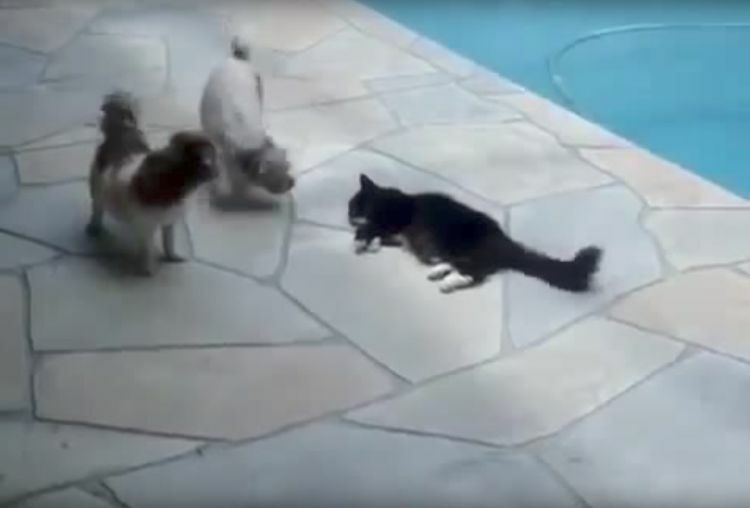 The cat is getting ready to teach them a lesson they won’t soon forget. And then the perfect time arrives! 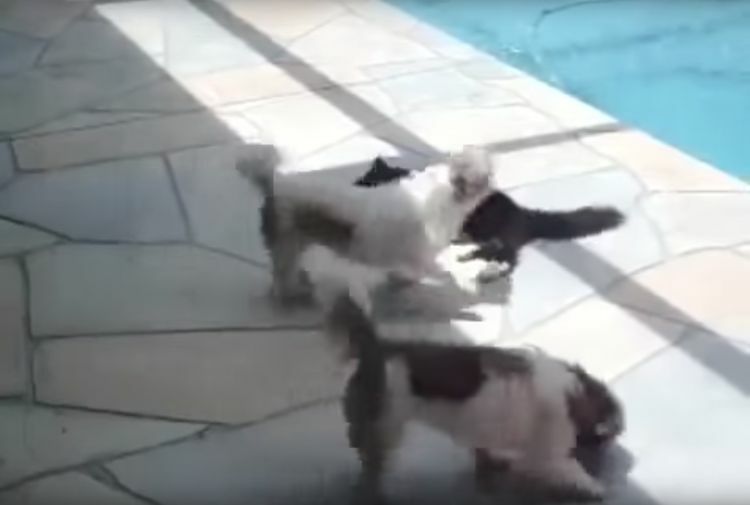 The dogs are momentarily separated, and that gives the cat the advantage. 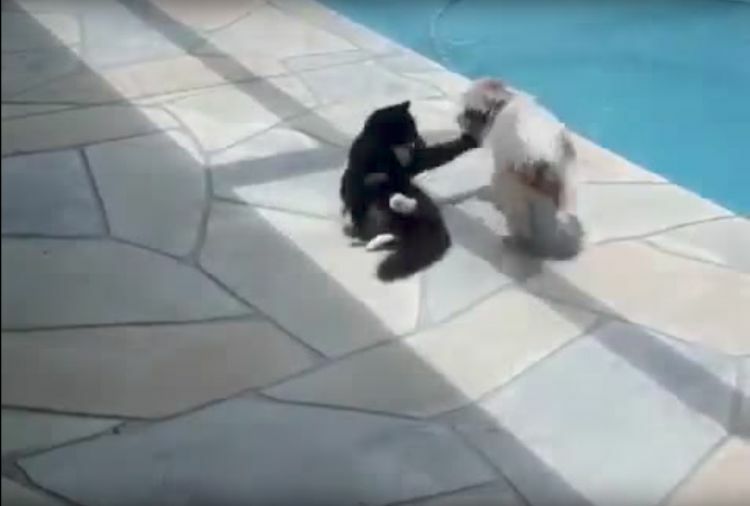 With one swift swipe, in the pool goes the dog! 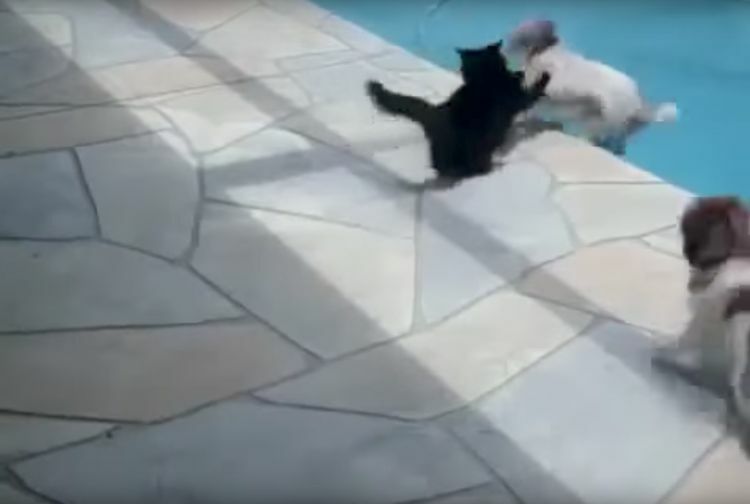 You can almost feel the cat’s satisfaction. But she’s not letting her guard down — there’s still another dog there. 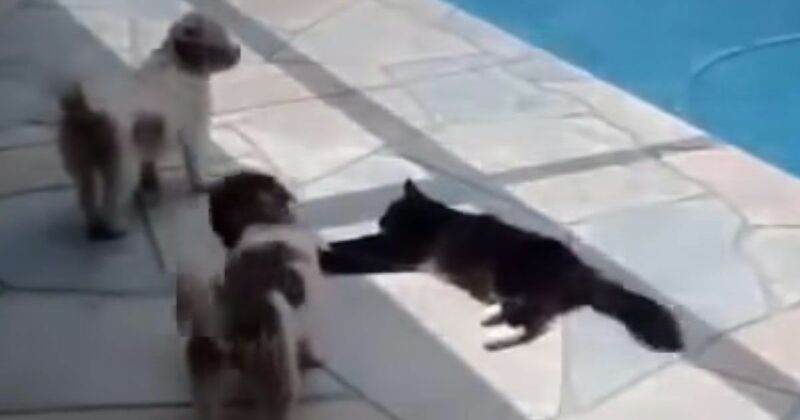 “Come here,” growls the cat, “and I'll give you the same!” But the dog doesn’t take her up on it. And for once, both dogs are silent! 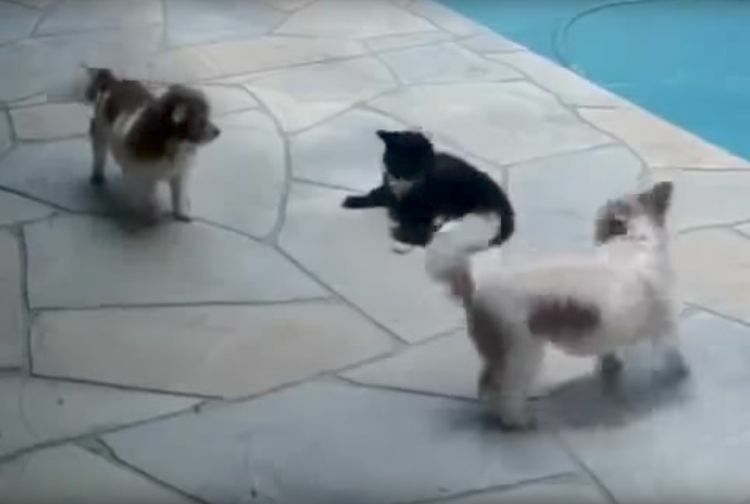 Share this hilarious video with your friends and see if they don’t agree that karma always wins out.